Unless otherwise noted, all Web addresses mentioned were functional as of 3-22-19. From the Cumberland Gap to the Atlantic Ocean, this is Virginia Water Radio for the week of March 25, 2019. This week, that excerpt of “Baldcypress Swamp,” by Timothy Seaman of Williamsburg, Va., opens a revised 2013 episode on a group of animals whose Virginia habitats range from still-water swamps to rocky ridges. These animals generate an equally wide range of human reactions, including, for example, their supposed removal from a large island by the namesake of a just-celebrated holiday. Have a listen for about 10 seconds to the following mystery sound, and see if you can guess this group of elongated, limbless creatures. If you guessed snakes, you’re right! You heard the distinctive sound of a rattlesnake. Legend has it that St. Patrick drove snakes from Ireland in the Fifth Century, although a prominent Irish natural history expert has maintained that snakes never existed at all on the Emerald Isle. In any case, an absence of snakes is certainly not true of Virginia. The Commonwealth has 34 snake species, some preferring dry, upland areas, while several other species inhabit semi-aquatic areas like streamsides, lakeshores, wet meadows, and areas around swamps and marshes. Virginia has three venomous species of snakes: the Timber Rattlesnake, including a Coastal Plain subspecies called the Canebrake Rattlesnake; the Northern Copperhead; and the Eastern Cottonmouth. The Cottonmouth is often confused with the widespread but non-venomous Northern Water Snake, with both having the common name “water moccasin.” Such cases of mistaken snake identities, along with misunderstandings of snake behavior, help cause widespread human fear and dislike of snakes generally. In contrast to those perceptions, snakes play an important ecological role as predators and as prey, with feeding upon rodents often providing a direct benefit to human properties; in medicine, snake venom has been used in research into cardiovascular diseases and cancer; and most Virginia snake species generally seek to avoid humans. Even if snakes give you the creeps, learning about their behavior and ecological roles can increase your appreciation for these adaptive reptiles of various land and water environments. Thanks to Timothy Seaman for this week’s opening music and to the U.S. Fish and Wildlife Service for the rattlesnake sound. We close with another musical selection, with a title that, if snakes could talk, they might take as a slogan for their valuable role in ecosystems. Here’s an instrumental part of “All Creatures Were Meant to be Free,” by Bob Gramann of Fredericksburg, Va. This Virginia Water Radio episode revises and replaces Episode 151, 3-4-13, which has been archived. “Baldcypress Swamp,” from the 2004 album “Virginia Wildlife,” is copyright 2004 by Timothy Seaman and Pine Wind Music, used with permission. More information about Timothy Saman is available online at http://www.timothyseaman.com/. The “Virginia Wildlife” CD was a collaboration between Mr. Seaman and the Virginia Department of Game and Inland Fisheries. The rattlesnake sound was taken from the U.S. Fish and Wildlife National Digital Library, http://digitalmedia.fws.gov/cdm/ (specifically at https://digitalmedia.fws.gov/digital/collection/audio/id/61). This sound was also part of Virginia Water Radio episodes 322 (6-27-16) and 371 (6-5-17). “All Creatures Were Meant to Be Free,” from the 1995 album “Mostly True Songs,” is copyright by Bob Gramann, used with permission. More information about Bob Gramann is available online at https://www.bobgramann.com/. Eastern Cottonmouth (Agkistrodon piscivorus) in Georgia, 2008. Photograph by Pete Pattavina, taken from the U.S. Fish and Wildlife Service’s National Digital Library, http://digitalmedia.fws.gov/cdm/, accessed 3/4/13. Northern Water Snake (Nerodia sipedon), photographed in Pulaski County, Va., August 16, 2015. Photo by iNaturalist contributor Shaun Hayes, made available for use on iNaturalist.org, under the Creative Commons Attribution-NonCommercial 4.0 International License (CC BY-NC 4.0), accessed online at https://www.inaturalist.org/photos/5324615, 3/25/19. Following is general information about snakes and how to respond if snakes become an issue around a residence or other property. 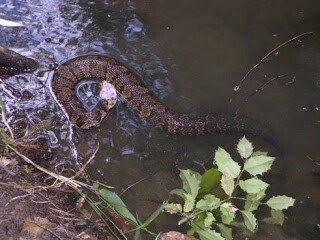 The information is from the Virginia Department of Game and Inland Fisheries, “Nuisance and Problem Wildlife/Snakes,” online at https://www.dgif.virginia.gov/wildlife/nuisance/snakes/. *there is a ban on collecting northern diamond-backed terrapins, spotted turtles, and eastern hellbenders (even though these species are not threatened or endangered, there is a specific regulation banning their collection). When keeping venomous species for personal use, check with [the] locality’s (city or county) ordinances regarding keeping such species. “Most snakes are harmless and, much like bats, provide a valuable service around your home in the way of pest control (snakes control rodents, bats control insects). In fact, the presence of snakes around your property or in your house may indicate a rodent problem. There are only three species of venomous snakes in Virginia. The copperhead (found statewide) is the most common; and while it is usually not found inside homes, it may be common in gardens and woodlots. Timber rattlesnakes are common only in the mountainous regions of western Virginia and a small area of extreme southeastern Virginia where they are known as canebrake rattlesnakes; they are a state endangered species. Water moccasins, also commonly referred to as cottonmouths, are found to the south and east of Petersburg and are common only in wet areas. “Eliminate habitat near your home. Remove all rock and brush piles and keep grassy areas mowed short near the house. This will eliminate attraction for mice and cover for snakes. “If a snake is known to have entered the structure, examine the foundation of the house thoroughly. Seal all areas around pipes, vents, or other places that may provide small openings both for rodents and snakes. Also, check the roof for overhanging vegetation. Snakes are good climbers and can also enter through the attic where trees or shrubs provide access. “If a snake is found in the house, identify the snake (a Snakes of Virginia guide is available from the Department). Once it is known to be non-venomous, carefully place a bucket or wastebasket over the snake. Then slip a board carefully under the bucket or basket and carry the snake outside and release it. Remember, if you have not sealed the holes in the foundation, the snake may return. “Have your house checked for rodent problems. If you can eliminate the food source, the snakes will go elsewhere. Maru Jaime Garza, “Snake venom used in medicine development,” Johns Hopkins University Newsletter, 2/14/13, online at https://www.jhunewsletter.com/article/2013/02/snake-venom-used-in-medicine-development-49746. Donald W. Linzey and Michael J. Clifford, Snakes of Virginia, University of Virginia Press, Charlottesville, 2002; information online at http://www.upress.virginia.edu/title/2509. Bernard S. Martof et al., Amphibians and Reptiles of the Carolinas and Virginia, University of North Carolina Press, Chapel Hill, N.C., 1980. Erin Maurer, “What is the ‘Emerald Isle?’” USA Today, 3/15/18, online at https://traveltips.usatoday.com/emerald-isle-34850.html. Joseph C. Mitchell, “Snakes of Virginia,” published in 1974 in Virginia Wildlife, online (as PDF; 8 pages) at http://www.people.vcu.edu/~albest/troop700/documents/TheSnakesOfVirginiaO.pdf. Joseph C. Mitchell and Karen K. Reay, Atlas of Amphibians and Reptiles of Virginia, Special Publication No. 1, Virginia Department of Game and Inland Fisheries, Richmond, 1999. James Owen, “Did St. Patrick Really Drive Snakes Out of Ireland,” National Geographic, 3/15/14, online at https://news.nationalgeographic.com/news/2014/03/140315-saint-patricks-day-2014-snakes-ireland-nation/. Virginia Department of Game and Inland Fisheries, “Fish and Wildlife Information Service,” online at http://vafwis.org/fwis/?Title=VaFWIS+Species+Information+By+Name&vUT=Visitor. Snakes species known from Virginia are listed at this link. 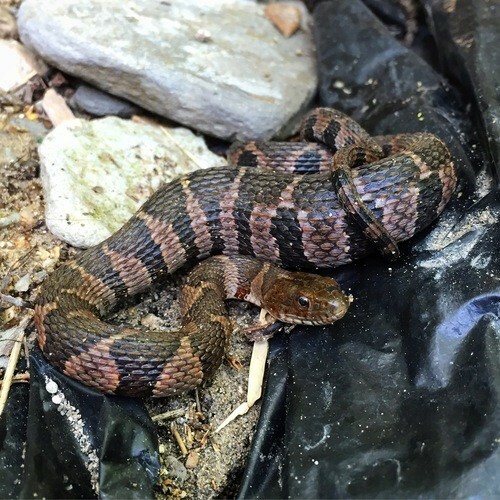 Julia Johns, “Virginia snake ID 'hotline' helps spare harmless snakes,” published by The Wildlife Society, 5/23/17, online at https://wildlife.org/virginia-snake-id-hotline-helps-spare-harmless-snakes/. Joseph C. Mitchell, The Reptiles of Virginia, Smithsonian Institution Press, Washington, D.C., and London, England, 1994. National Estuarine Research Reserve System, “Estuary Education” video series, online at https://coast.noaa.gov/estuaries/videos/, has several short videos on reptiles that live in or near water, including the following: American Alligator; Freshwater Turtles in an Estuary; New Jersey Terrapin Close-up; Texas Alligators Q&A; Totally Turtles; Tracking Turtles; Turtle Hospital; Turtle Tales; and Turtle Trails. Smithsonian Institution, “Bibliography on the Biology of Amphibians and Reptiles,” online at https://www.si.edu/encyclopedia_si/nmnh/reptshrt.htm. Virginia Department of Game and Inland Fisheries, “Wildlife Information,” online at https://www.dgif.virginia.gov/wildlife/information/. From this link, one can access information about individual species of reptiles or other wildlife groups. All Water Radio episodes are listed by category at the Index link above (http://www.virginiawaterradio.org/p/index.html). See particularly the “Reptiles” subject category.